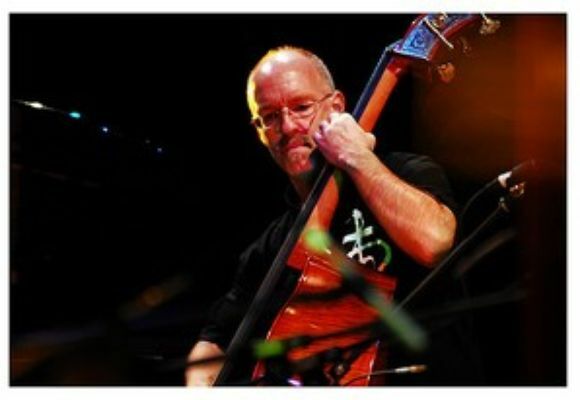 A veteran of the New York City jazz scene for over 20 years, bassist Bill Moring has established a reputation as one of the city's most in demand players. The versatile musician has proven himself equally adept at anchoring the big bands of legends Count Basie and Woody Herman, jammin' jazz/funk and beyond with the Dave Stryker/Steve Slagle quartet or stretching harmonic and rhythmic boundaries with John Hart and Chris Potter. Bill was born in Ft. Wayne, Indiana in 1958. After high school, he attended Indiana State University for a year, also playing in cellist Hank Roberts group. He began gigging around Indianapolis and Cincinnati at the same time coming under the tutelage of local pianists Claude Sifferlen and Steve Allee. In 1980 he began working with John Von Ohlen's big band, playing every Monday at the Jazz Kitchen in Indianapolis, recording a live record that was Grammy nominated. Bill also had the opportunity to play locally with such notables as Dizzy Gillespie, Slide Hampton, and Cal Collins. Bill moved to New York City in 1984 and immediately began working with drummer Mel Lewis. His first road gig came when he joined Woody Herman's Thundering Herd in 1985. In 1986, Bill received a National Endowment for the Arts Grant to study with Rufus Reid. He continued his studies with the legendary Homer Mensch. In 1987, Bill got the gig with the Count Basie Orchestra and spent the next year touring, performing at the Hollywood Bowl, the North Sea, Umbria, Grande Parade Du Jazz, and Pori jazz festivals among other venues. Bill is active today recording and performing with a wide variety of artists. Other big band experiences include the Village Vanguard Orchestra and the Toshiko Akiyoshi/Lew Tabakin Jazz Orchestra. He has played with renowned singers such as Joe Williams, Mel Torme, Diane Schurr, Dakota Staton, Maxine Sullivan, and Susannah McCorkle. He has played with jazz legends Frank Foster, Al Cohn, Clark Terry, Mickey Roker, Tommy Flanagan, Junior Cook, Roland Hanna, Vernel Fournier, Mel Lewis, and Ray Barretto. He has also performed and/or recorded with many contemporary artists including John Abercrombie, Gary Bartz, Manolo Badrena, Larry Coryell, Vic Juris, Dave Kikoski, Billy Hart, John Hart, Eddie Henderson, Joe Locke, Mulgrew Miller, Chris Potter, Dom Salvador, Dave Stryker, and James Williams. An advocate of music education, Moring has hosted an assortment of student clinics at various high school and college jazz festivals in the US and abroad and is currently on the faculty at Montclair State University and the Jamey Aebersold Summer Jazz Workshops. In addition to his private students, he has worked with students individually and in various sized groups at Rutgers, The New School, Jersey City State, Long Island University, SUNY Purchase, and NJPAC Jazz for Teens among others.